A sudden and uncontrolled drop of the tailgate on your Dodge Ram is unsettling. Wham! Free yourself from the frustration of juggling overflowing loads and properly bracing a dropping tailgate with the EZ Down tailgate damper. The EZ Down installs in minutes. All parts are included in the kit, and there are no holes to drill. NOTE: Does not fit '09 Dodge 1500 trucks. I should have read the reviews on this product prior to purchasing. I looked at a YouTube install video and assumed the product would function as seen in the video. Everything went well with my install until I tried to shut the tail gate. There is major interference with the strut provided in the kit and the tail gate cable. This does not allow the cable to fold up normally in the space between the bed side rail and the tail gate. The cable either binds or sticks out through the gap- definitely not cool. The idea of the product is good but the application in mt 2003 Ram 3500 does not work. Going to send this one back. Owner Response:The cable will need to be bent towards the cab in some cases to allow it to clear. I would recommend this product. Only complaint is that it does not slow the decent of the tailgate as much as I expected. 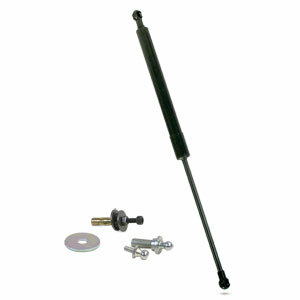 Nevertheless the EZ Down tailgate strut is a quality product and is easy to install.